Shopping for a Deal on a Bank Foreclosure? 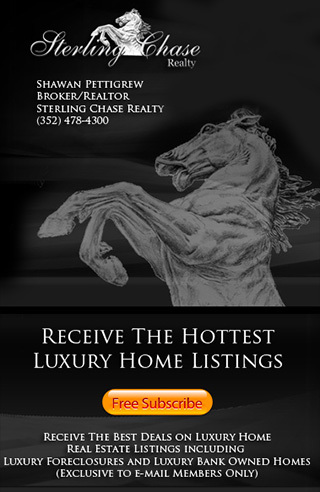 Sterling Chase Realty offers our buyers direct access to all Bank Foreclosures for Sale and Bank Owned Real Estate Listings. Luxury Bank Foreclosures are in high demand and we are your direct source to view all. Bank Owned Foreclosures For Sale FL. Search all Bank Owned Homes For Sale in Central Florida. Find Bank Owned Homes, Bank Foreclosures, Bank REO & more! Our Virtual Property Search will automatically match your selected criteria and instantly send to your in-box the latest Luxury Home Bank Foreclosures. This exclusive FREE service is provided by Sterling Chase Realty and is the only source available to instantly view photos, details, make offers and take advatage of great deals! We can also offer great financing terms on many of these Luxury Home Bank Foreclosures. Below you will see all Luxury Home Bank Owned Foreclosures for Sale. This Page is updated daily so you are sure to see the latest Luxury Home Bank Foreclosures information.